We’d love your help. Let us know what’s wrong with this preview of Toto's Tale and True Chronicle of Oz by Sylvia Patience. 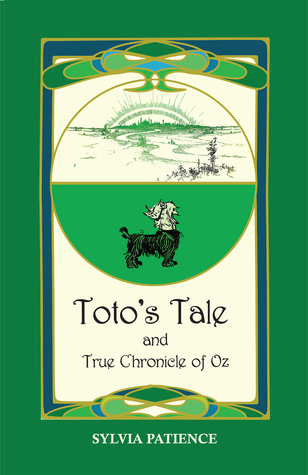 To ask other readers questions about Toto's Tale and True Chronicle of Oz, please sign up. Do you know who drew the charming illustrations I've included in Toto's Tale and True Chronicle of Oz? I first obtained this book through Netgalley and it asks you what attracted you to it. Was it the cover? Had you heard a lot about it? My reason for choosing it wasn't there. I chose it because I love anything to do with the Land of Oz. It is quite possibly the most enchanting fictional place I've ever read about. Not only have I read the originals by L. Frank Baum but I've read Gregory Maguire's spin on things as well as seen the musical Wicked! All of which I have loved, I just can't get enoug I first obtained this book through Netgalley and it asks you what attracted you to it. Was it the cover? Had you heard a lot about it? My reason for choosing it wasn't there. I chose it because I love anything to do with the Land of Oz. It is quite possibly the most enchanting fictional place I've ever read about. Not only have I read the originals by L. Frank Baum but I've read Gregory Maguire's spin on things as well as seen the musical Wicked! All of which I have loved, I just can't get enough. So how could I resist hearing it from Toto's point of view? The only animal in Oz that, until now, has never had a voice? The author has obviously read the Oz books religiously, she knows them very well and the idea of hearing Toto's version is one of genius. I like the fact that it is true to the books rather than the film. (as much as I like the film) It gives it more of the ring of authenticity and Toto himself is a quirky and funny narrator. I liked to revisit the adventures of Dorothy told from Toto's POV, since I read the original book 25 years ago. There are some small original additions, that were funny to read. I received this copy from the publisher through NetGalley in exchange of an honest review. Recommends it for: Oz fans and/or if you love dogs. Yes, we're definitely not in Kansas anymore, Toto. Sigh. I really love this charming book. It perfectly captures the heartwarming spirit of The Wonderful Wizard of Oz. We all love the original story, the loveable Jack, Nick and Leo and obviously Dorothy and Toto. Then what's it like to see everything from the eyes of the feisty, boisterous pooch? "That's my mouse." Its whiskers twitched toward me. I had learned about cats in Uncle Henry's barn. and could tell when one was going to fight. Fur was about to fly. I had to restrain myself not to hug my dog too tight when I read this book. Sorry Milo, Toto is so cute and you're the closest dog around. "Toto," Dorothy said, "do you think the Wizard will really be terrible?" "Grr-rowf!" I said. I will protect you. And as a dog lover, I often think we don't deserve their love and devotion. I mean, free meals and accomodation in exchange of unconditional love forever? We humans get the better end of the deal. A recommended read for Oz fans and/or if you love dogs. NOTE: Received as an ARC from Netgalley. We all know he exposed the "man behind the curtain," but in this retelling from Toto's point of view, we learn that he played an even bigger role in the famous story. The author does a pretty good job of matching Baum's writing style, with a hint of the MGM movie. A fun addition to the Oz books. Usually when people write retellings or reimaginings of well-known stories they either set the story in the same world, but write about a completely new character or flesh out a secondary character who doesn't have much backstory, or they just use the bare-bones plot and themes and write totally outside any basis on canon. This story was none of these. The story was very much scene for scene, action for action the original Wizard of Oz book. So first of all how imaginative is that? I could sit do Usually when people write retellings or reimaginings of well-known stories they either set the story in the same world, but write about a completely new character or flesh out a secondary character who doesn't have much backstory, or they just use the bare-bones plot and themes and write totally outside any basis on canon. This story was none of these. The story was very much scene for scene, action for action the original Wizard of Oz book. So first of all how imaginative is that? I could sit down and write the original story from the Tin Man's, Scarecrow's, or Lion's POV in very little time. The only difference was she gave Dorothy a tiny two or three paragraph backstory, pre Auntie Em and Uncle Henry, and gave the Scarecrow a proper name and the Lion a proper name. The major theme of this book was Toto's desperate want to be able to talk like all the other beasts in Oz. Well, in book eight, Tic-Tok of Oz, it is revealed that Toto was able to talk as soon as he landed in Oz, he just didn't want to. So the audience for this book is reduced to people who will only be reading this story alone and none of the other Oz books, including The Wonderful Wizard of Oz. I was going to recommend this book as a children's alternative to the original story because it is the same, but with much less violence. However, I feel the Toto deviation ruins it for that purpose, and also the writing was on the bland side. This is an utterly charming account of the famous Oz adventure... told from the point of view of the little dog. He makes for a thoroughly delightful narrator, offering a unique perspective, complete with astute canine observations like smells and tastes. The narrative feels rich and textured with the emphasis on these often-neglected senses. And Toto's voice is fantastic, with plenty of wry commentary that made me smile and laugh throughout the story. The clever narrative stays faithful to Toto's dog perspective, with wonderful lines like: "But now I might have lost her. This was the only time I'd been out of smell of her since we came to Oz." Toto also fills us in on some interesting background about how Dorothy ended up with Aunt Em and Uncle Henry. She arrived on an orphan train from New York, and adopted Toto just as she was being adopted by her new family. This glimpse into Dorothy's personal history-- and the history of our country-- make the story even more vibrant and emotionally resonant. This adventurous tale will appeal to readers and listeners of all ages, and provoke fun comparisons with other, non-canine-focused versions of the famous story. Readers, especially the young and young-at-heart, will fall in love with Toto's voice, and cheer him on throughout his adventure. For all you fantasy fans, this is a real treasure. As the author explains, it was inspired by the original Wizard of Oz stories by Frank Baum, not the 1939 movie starring Judy Garland. However there are enough bits and pieces in the narrative that will remind you of episodes of,the film, that both book lovers and movie fans should be happy. One difference you will notice immediately is that the classic ruby slippers of the movie are silver. The story is charmingly illustrated with some of the or For all you fantasy fans, this is a real treasure. As the author explains, it was inspired by the original Wizard of Oz stories by Frank Baum, not the 1939 movie starring Judy Garland. However there are enough bits and pieces in the narrative that will remind you of episodes of,the film, that both book lovers and movie fans should be happy. One difference you will notice immediately is that the classic ruby slippers of the movie are silver. The story is charmingly illustrated with some of the original drawings, now in the public domain. Telling the story of Dorothy's adventures from the perspective of Toto was ingenious. Toto is the only character who can't give voice to human speech so he is frequently frustrated, but it adds an extra challenge to each of the episodes in the journey and makes the little dog even more endearing. The sentence structure and plot elements are simple enough for a child to understand, and although there are a few dangerous situations, it is unlikely to give nightmares like the movie or the stories of Harry Potter. This book was recommended to me by my sister probably since as Kansans we aren't only aware of all the Oz jokes that come with the territory but since we also enjoy the fake note that is passed around that is suppose to have come from Toto about him taking the slippers and leaving Dorothy behind. Also I was deeply vexed due to the fact that although Toto is a loyal and staunch friend, he is also the only one who doesn't seem to talk with the exception of one book where it wasn't much of anythin This book was recommended to me by my sister probably since as Kansans we aren't only aware of all the Oz jokes that come with the territory but since we also enjoy the fake note that is passed around that is suppose to have come from Toto about him taking the slippers and leaving Dorothy behind. Also I was deeply vexed due to the fact that although Toto is a loyal and staunch friend, he is also the only one who doesn't seem to talk with the exception of one book where it wasn't much of anything besides him mentioning that he doesn't feel like talking. Anyway this book is a fun and slightly creative version where the reader is taken through Baum's edition of the story although some creative licensing has been done with the story and the fact that it is told from Toto himself. As a result the reader gets to find out the history of Toto from his birth and what is running through his head even as he meets up with the legendary characters that form the odd group of heroes as well as what he wishes to come true. For other Oz fans they will also enjoy the fact that the original illustrations were taken from the original thus they add an anchoring stability for the reader who finds themselves in this oddball retelling. Although I was not a fan of the illustration style when the Oz books came out they do add their own vintage charm and warmth to the story, especially since in many cases the illustrations chosen were ones that mainly included Toto. What I didn't like about this book, though, was some of the subject matter. I am not quite sure whether the author is a dog lover but from the impassivity of Toto's mother, which was unlikely, the story just reeked of being incorrectly narrated. Also there was way too much focus put on Toto wanting to raise his leg and mark his territory everywhere, which as a male dog would do naturally but I don't think it was necessary for the story. Toto's Tale is a classic remake of The Wizard Of Oz through the eyes of Toto the dog! It starts off how Toto came to be with Dorothy in Kansas to everything that happened in the land of Oz and having a few surprises along the way. If you want to read a classic book that has being retold and twisted in a good way, then this is the book for you! I love The Wizard Of Oz and when I saw this book, I knew I had to read it and it didn't disappointed me at all. I loved how everything got a new twist to t Toto's Tale is a classic remake of The Wizard Of Oz through the eyes of Toto the dog! It starts off how Toto came to be with Dorothy in Kansas to everything that happened in the land of Oz and having a few surprises along the way. If you want to read a classic book that has being retold and twisted in a good way, then this is the book for you! I love The Wizard Of Oz and when I saw this book, I knew I had to read it and it didn't disappointed me at all. I loved how everything got a new twist to the classic and having the slippers silver instead of red was kinda perfect for this story. It's kinda interesting to read books like this that give a whole new perspective on someone else's view on a classic tale and you can't help but wonder, what other books can be done like this just to get a new view on things! Thank You to Sylvia Patience for writing this new but classic tale that makes me want to go watch and reread The Wizard Of Oz!! This cute, clever book is a retelling of L Frank Baum's The Wonderful Wizard of Oz from Toto's POV. Toto is a funny and brave little narrator who offers up interesting tidbits that were maybe overlooked in the original tale *wink*. (For instance, Toto figures out how to defeat the Wicked Witch of the West...after he pees on her foot.) The book is well-written, fast paced and full of action and heart. I think readers of all ages will enjoy this book. Toto's Tale and True Chronicle of Oz by Sylvia Patience is a delight to read. The author is a friend, and I copy-edited the book for her, so I may be biased -- but I'm not writing anything I don't feel, and I'm quite picky about books. The book is narrated by Toto and his outlook is totally terrier! Which leads to a good few outright funny moments. If Toto's narrative voice is half of the charm of the book, the other half is in the vivid and entertaining retelling of the familiar Wizard of Oz sto Toto's Tale and True Chronicle of Oz by Sylvia Patience is a delight to read. The author is a friend, and I copy-edited the book for her, so I may be biased -- but I'm not writing anything I don't feel, and I'm quite picky about books. The book is narrated by Toto and his outlook is totally terrier! Which leads to a good few outright funny moments. If Toto's narrative voice is half of the charm of the book, the other half is in the vivid and entertaining retelling of the familiar Wizard of Oz story. Patience adds a beautiful element of depth to Dorothy's story, providing a touching history of how she ended up living with Aunt Em and Uncle Hentry, and how Toto arrives on the scene. The illustrations are taken from the original book -- they are in the public domain, so no legal issues there. Along with with the period feel of the book design, they give the book a look that goes right along with the quality of the story. I received an advanced copy of this book via NetGalley in exchange for an honest review. This is a delightfully written tale exploring L. Frank Baum's famous story of the Wizard of Oz, but this time told through the eye's of Dorothy's faithful dog Toto. Narrating the tale throughout, Toto provides a unique perspective on the well-known adventure, frustrated by his inability to talk like the other characters but clearly with plenty to say! The action stays true to the original storyline, although we I received an advanced copy of this book via NetGalley in exchange for an honest review. The action stays true to the original storyline, although we also discover how Dorothy came to be living with Aunt Em and Uncle Henry and how Toto became part of the family back in Kansas. Too many people think that the Wizard of Oz story is essentially the remarkable film version. It's a great movie (one of the few that I do still watch repeatedly), but of course there's much more to the book upon which the move was based. This delightful little book, Toto's Tale and True Chronicle of Oz, by Sylvia Patience, recounts the familiar story (as told in L. Frank Baum's book) but from the viewpoint of the only other character who has been through everything that Dorothy Gale goes through ... her dog, Toto. Author Sylvia Patience takes an interesting track by anthropomorphising Toto - and why not...we already have a human-like scarecrow and tin woodman and an anthropomorphic lion, so why not? But his human-like attitude ends there... Toto, unlike the lion, cannot speak and it is this desire (to speak) that motivates him to get to Oz to meet the wizard. But of course, by not being able to speak, he can't communicate his desire to anyone else. Only one person manages to understand his desire, but I won't say who that is. The book even manages to include some of the wonderful Denslow artwork, now in the public domain. It was definitely fun to revisit Oz in this way and it had me remembering the original book (which I last read, perhaps six years or so ago) and as I read I wondered how closely it would follow the Baum story, and if memory serves, it does so quite well. But at the same time, that's kind of the problem. This is the same story that Baum told. Same goal (get to Oz to have wishes granted), same obstacles. Only the viewpoint is different. And I can't help but wonder - what's the point? We already have this story! Yes, there are a few additions, some downright clever, but it's still primarily the same story. And since Baum wrote a series of Oz books, I wonder why Patience didn't write a continued journey - a new story. With Toto returning and having his own adventure, perhaps. If I were to read a story of Oz to my children (and I have), I would start with the original, then move on to Baum's additional stories. Reading someone else's version of the original story would be very far down on my list (unless it were significantly better than the original). Looking for a good book? Toto's Tale and True Chronicle of Oz, by Sylvia Patience, is a fun re-telling of the Wizard of Oz story with a little bit of a twist, but it is, essentially, the same story as L. Frank Baum's classic, The Wonderful Wizard of Oz. I’ve been a fan of The Wizard of Oz since I was a young child. Though I remember checking out the books from the library while in the second grade, I’m not sure I ever actually read the books. So for me, this was a new and interesting twist on an age old tale, one I’m sure mirrors the original story far more than the movie and play I am more familiar with. However much I enjoyed the prospect of seeing a more thorough and different view of Oz. I felt the use of Toto as the narrator didn’t work out as well as I had hoped. For one, his point of view didn’t really add a lot of interesting know all for the story. This is an age old tale and the only difference between his point of view and everyone else, is the fact he’s peeing on things, constantly smelling things and over all being a dog. This is really sad because I thought it was an adorable idea and I was extremely excited to read it. Now before you think I found this to be a terrible book, please know this isn’t the case. I feel as an adult, the book didn’t hit the mark for someone like me. However, as a mother, I can completely see my son enjoying this book. In fact, I may even make this our bedtime story and see what he thinks. But he’s nine and I feel a child of that age would not only be able to enjoy the experience of Oz, but they can better appreciate Toto’s point of view. Especially in regards to Toto’s constant frustration at not being heard (because he’s a normal dog and can’t speak). Children can relate to this feeling and I think they would greatly enjoy the idea of him running around marking his territory. I would highly recommend this book to anyone who is looking for a good story to share with their children. Especially if The Wizard of Oz is a family favorite for you, like it is in our household. L. Frank Baum wrote 14 novels about the land of Oz before his death in 1919. The books were so popular that sequels continued to be written after his death by many different authors. There have also been stage plays, musicals, an early silent film and, of course, the glorious 1939 film starring Judy Garland. Yet, despite all of the above, no one has written Toto's side of the story. 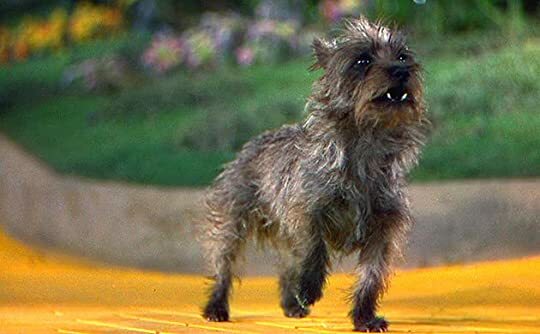 (You remember Toto, the adorable little dog who never left Dorothy's side. Who can ever forget the Wicked Witch of L. Frank Baum wrote 14 novels about the land of Oz before his death in 1919. The books were so popular that sequels continued to be written after his death by many different authors. There have also been stage plays, musicals, an early silent film and, of course, the glorious 1939 film starring Judy Garland. Yet, despite all of the above, no one has written Toto's side of the story. (You remember Toto, the adorable little dog who never left Dorothy's side. Who can ever forget the Wicked Witch of the West cackling "I will get you and your little dog too"?) Until now. I picked up this story to get a start on it and I was unable to put it down until I was finished with it. It is, to me, better than the original 1930 one. This is based on that book and not the movie that was on tv every year. This is Toto's recounting of the story. It is sad that so often he tried to get his message across but no one would pay enough attention to him. Don't expect Dorothy to wake up in bed and say, "and you were in it! And you were in it!" Some of my most unforgettable moments I picked up this story to get a start on it and I was unable to put it down until I was finished with it. It is, to me, better than the original 1930 one. This is based on that book and not the movie that was on tv every year. This is Toto's recounting of the story. It is sad that so often he tried to get his message across but no one would pay enough attention to him. Don't expect Dorothy to wake up in bed and say, "and you were in it! And you were in it!" Some of my most unforgettable moments were: poor Toto, the puppy, was going to be drown in a trough, and ran away to find Dorothy, just off of the orphan train. When Toto gets a ride by an undersized flying monkey who can't keep up with the others. And my favorite: Toto relieves himself, deliberately, on the old witch's leg. I am so glad the munchkins didn't make a big production out of Dorothy killing the wicked witch of the East. It was an extremely good book that grabs your attention and holds you captive until the very end. I obtained a copy of this book from NetGalley. This is a fun little retelling of the Oz story from Toto, Dorothy's dog. It's been a while since I read/watched anything from Oz, and I've been meaning to refresh my Oz experience as the details were all muddled in my head. For anyone in the same situation as I was, you should consider reading this book. It offers a fresh perspective on the tale while remaining true to the story line. Toto was such a darling, I enjoyed reading about his observations I obtained a copy of this book from NetGalley. For anyone in the same situation as I was, you should consider reading this book. It offers a fresh perspective on the tale while remaining true to the story line. Toto was such a darling, I enjoyed reading about his observations and comments on Dorothy. "Woof woof!" I really felt his frustration at being unable to be understood in a magical land where all the creatures and animals could talk. I enjoyed this book about the Wizard of Oz from Toto's point of view. The illustrations scattered throughout the book were also a nice addition, and I loved how they had a vintage feel. In this story, Toto has a wish that he'd like fulfilled by the Wizard, but he can't speak and he doesn't know how to let anyone know. As the story progresses, we see all the times that Toto has noticed something helpful, and he can't share it with anyone. All his traveling companions can communicate with each oth I enjoyed this book about the Wizard of Oz from Toto's point of view. The illustrations scattered throughout the book were also a nice addition, and I loved how they had a vintage feel. In this story, Toto has a wish that he'd like fulfilled by the Wizard, but he can't speak and he doesn't know how to let anyone know. As the story progresses, we see all the times that Toto has noticed something helpful, and he can't share it with anyone. All his traveling companions can communicate with each other which makes it even more frustrating because he can only bark. What Toto wants most is to be able to talk. Since I never read the actual book, I can't compare them. I watched the movie, but it has been quite a number of years ago. From what I remember of the movie, this does have some differences. I recommend this book, and I'd like to thank Netgalley, Sylvia Patience and IBPA for the opportunity to read it. 26 book challenge- a book with a lion, a witch, or a wardrobe. As a child The Wizard of Oz was my hands down favorite movie. Somehow I didn't read the book until much later, but I loved that too. I was thrilled when I saw this book because Toto was always my favorite character. This was a very cute story from Toto's point of view. There are a few changes from the original but not too many. Some of conversations seem to be word for word. The tin man, lion and the scarecrow got names. I thought tha 26 book challenge- a book with a lion, a witch, or a wardrobe. This was a very cute story from Toto's point of view. There are a few changes from the original but not too many. Some of conversations seem to be word for word. The tin man, lion and the scarecrow got names. I thought that must be just to Toto but it wasn't. That was a little weird. At the beginning there was quite a bit of Toto translating his barks and marking things. After they met the Lion (Leo) we heard more of Toto's thoughts. I would definitely recommend this to either Oz fans or dog lovers. This was such a charming story and a creative edition to the Wizard of Oz series. The book closely parallels the book version of the Wizard of Oz, which differs slightly from the movie. She gives Toto such a charming personality and understands his desire to be social and communicate with his friends. I love how he corrects versions of the story that have eliminated his role as the hero without disdain or bragging but more with a desire to gain some additional affection. His constant commentary o This was such a charming story and a creative edition to the Wizard of Oz series. The book closely parallels the book version of the Wizard of Oz, which differs slightly from the movie. She gives Toto such a charming personality and understands his desire to be social and communicate with his friends. I love how he corrects versions of the story that have eliminated his role as the hero without disdain or bragging but more with a desire to gain some additional affection. His constant commentary on food that he likes or needs reminds us what he values almost as much as Dorothy. Finally, his howls are so realistic. Ms. Patience seems to truly understand Cairn Terriers. I say this, because I have one, and she howls just as Toto does, when she is excited. Thanks to the publisher and Netgalley for an e-ARC of this book. train from NY. This littl Thanks to the publisher and Netgalley for an e-ARC of this book. This is my favourite version of the wizard of oz. I just love that it was told from totoes point of view. The pictures in this book were amazing. I would highly recommend this retelling of The Wizard of Oz. I didn't like the fact that there was no ruby slippers silver slippers just don't cut it. I like that we were interduced to all four witches although we never get told the other good witches name. This is a fun entertaining read and I will diffently be reading it again in the near future. I would This is my favourite version of the wizard of oz. Seriously charming little book. We haven't heard Toto's side of the story and his travels in Oz before. I loved this little book, and if you have Wizard of Oz fans, or dog fans (and who isn't?) you'll love this little tale. Toto's tale is a cute retelling that (mostly) stays true to the original story. If you loved the classic, you'll love this. Ever wonder what Toto was thinking during the journey? Now he's got the voice and wit to tell you! Delightful and an interesting twist to the classic. I bought a copy for my granddaughter, then decided to get myself a copy too. Loved the opening three chapters and the ending. Loved the "voice" of the dog, which was set free at the end. Sylvia Patience lives in Santa Cruz, California with her family and Toto, her little dog, too. She is a poet and author of four other, as yet unpublished, middle grade children’s novels, including "Shell, Crossing the Border" and "Wandering Time."